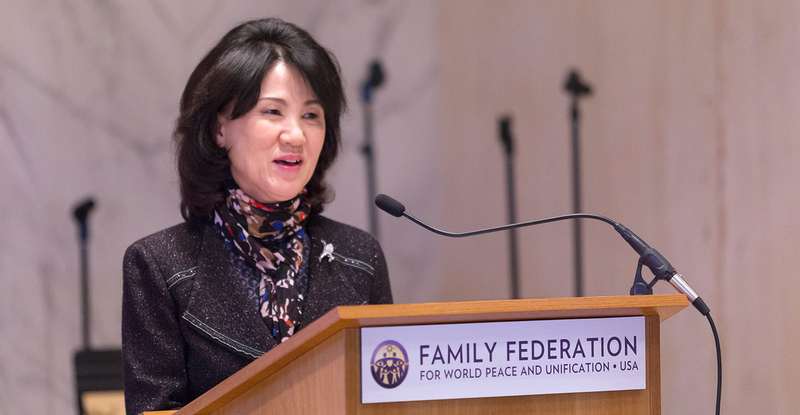 FFWPU USA: Wonju McDevitt, chief secretary for True Mother, related her experiences reading Hoon Dok Hwe (study of scripture) for True Parents every day for the last 33 years. Hello, everybody. Paul Fontaine made this podium for me to read Hoon Dok Hwe (scripture). We were doing Hoon Dok Hwe every morning here, in such a precious place. I’m so happy that you have this meeting today. True Mother gave me a two-week break to visit my family. I can visit my family here twice a year. I am so happy and honored to have this opportunity here. My name is Wonju McDevitt. I am Chief Secretary for True Mother right now. I am staying with True Mother in Korea. In 1982, when I came to East Garden to join my husband, True Father asked some Korean sisters to join him in reading a magazine, the Tong Il magazine. I was youngest one, so I couldn’t go. I stayed downstairs while some people went up, and then somehow I was called, so I went there, and I read the magazine. True Father said, “Okay, from today on, you will read every day.” That was in 1982. So I was reading in front of True Father. I was—what?—25 or 26 years old. I was so scared in front of True Father. I read every day. When he woke up at 3:00am, I had to read in the morning, so sometimes I recorded these readings. True Father told me to record his speeches starting from Volume One. I recorded until Volume 100. After that, I couldn’t do any more. True Father listened to my recordings at night when he was sleeping, or as soon as he woke up. As soon as he would see me, I had to read. When we went to South America in the middle of 1990, we were going around the Amazon. Wherever he went, I had to read. One time, no leaders were around, just myself and True Parents. I didn’t know what to do, so I had to read the whole book, all the books; whatever I had, I had to read. I always had to read. We were in South America—Uruguay and Punta de l’Esta, reading every morning and every night, and finally in 1997, Father established Hoon Dok Hwe. I’ll never forget that experience. Whenever I got into a car or plane or even boat (except when he’s fishing, we had to be quiet—at that time I could relax! ), whenever there was a chance, I had to read. When we were traveling in Europe, I had to sit in the front seat of a small car with a book. I had to read, and thank God I never got car sick. I had to read. That was my precious memory. Even in a small jet, a small helicopter, wherever we went, True Father wanted me to stand up and read, every time. That was such precious memory with True Father; because of that I could learn so much about True Parents, and also Jesus Christ. Through True Father’s words—his speeches Volume One through 20—when I read I really feel Jesus Christ. I cry so much, whenever his words come to say Jesus Christ. I cry because of True Father’s words. Through Hoon Dok Hwe, I became mature. After True Father passed, True Mother really concentrated on the Cheon Seong Gyeong and Cham Bumo Gyeong. True Mother is really praying hard. This year, in January, Dr. Ki Hoon Kim was with us in Hawaii. We had to read the Cham Bumo Gyeong, and it was so good. So inspired. I cried, True Mother cried, Dr. Kim cried. We cried and we read. And True Mother was so happy. If True Mother was here, she would give you a special treat. I know, because True Mother really, really appreciates people who translate and edit the speeches, the Cham Bumo Gyeong. True Mother really appreciates it. You already know True Mother is coming. She really wants to come and comfort you, so I’m so happy, because I live in America, too. Thank you very much!